Suitcase boxes are in high demand in trade shows, conventions, medical centers, automobile traders, industries, manufacturing facilities, digital companies, classes and drug stores. 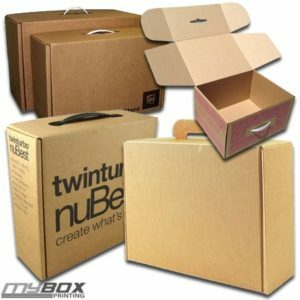 Self closing custom suitcase boxes are a unique twist on conventional packaging. These briefcase-type boxes with a handle are designed to occupy little areas and are used as bin containers to protect your stuff from any damage while being shipped or stored. What Makes Our Suitcase Boxes Special? Our custom suitcase boxes are accepted to be strong and able to ship and store heavy products securely. These boxes are manufactured in all custom shapes and sizes using recycled material and highest quality printing. This Christmas, we have announced a 10% discount on our custom suitcase boxes. So if you want to get benefited from this offer and receive your boxes before Christmas, we recommend to contact our sales department now to get a no obligation quote.